The weather forecast looks promising for Saturday’s annual cleanup of the Neponset River and the surrounding estuary and walking paths. The event — organized by the state’s Department of Conservation and Recreation (DCR) and the Neponset River Watershed Association (NepRWA)— will target three sections of the riverfront, including two in Dorchester: Lower Mills and Cedar Grove. Last year, as scores of volunteers descended on the riverbanks with the same objective, they hauled off a disturbingly large volume of detritus. The clean-up crews filled three thirty-yard dumpsters with some six tons of debris and garbage— a stark reminder of just how much junk gets deposited into our treasured natural resource each year. Chris Spillane, who helps to coordinate the cleanup for the state agency, told the Reporter last week that tires, batteries, even a bathtub, were among the junk pulled from the sensitive marshland. “We couldn’t believe the amount of debris we picked up. We weren’t ready for it,” he said. Not all of it is generated here in Dorchester or Mattapan, of course. The Neponset meanders through more than a dozen towns on its journey from Foxborough to Dorchester Bay. But, clearly, our shoreline is hard hit. Thankfully, the cleanups have been generating large turnouts— and this weekend is expected to be larger still. One reason: More people are discovering the Neponset for the jewel that it is thanks to a remarkable reclamation effort that has been reuniting residents and river for more than four decades. Guided by stalwart activists who attend monthly meetings, and powered by state lawmakers who put state dollars into land-takings and new parklands, the Neponset is no longer a mystery waterway walled off by power plants, train tracks, and rusting fences. Two new symbols of this transformation will officially come on line in the coming weeks, although in practical terms they are already in use. First, in Port Norfolk, a 15-acre park, snatched back after more than a century of inaccessibility, is now being enjoyed by runners, walkers, cyclists, and sunbathers. The $4.25 million investment was set in motion in the 1970s when neighbors started to lobby their legislators to seize an old paper plant through eminent domain. State officials are still working out the details of a ceremony (tentatively set for Sat., May 6) in which the park will be officially named for the late state Sen. Joseph Finnegan, who represented Dorchester in the 1930s. His son, John J. Finnegan, now 77, also served in the Legislature from 1967 to 1981 and was instrumental in securing the Port Norfolk land— and other parcels along Dorchester’s waterfront— for eventual public use. Upstream, in Milton and Mattapan, a new 1.3 mile extension of the Neponset Greenway trail is opening up an expanse of the riverfront that has been rarely seen by recent generations. (No official dedication for this section is yet scheduled.) 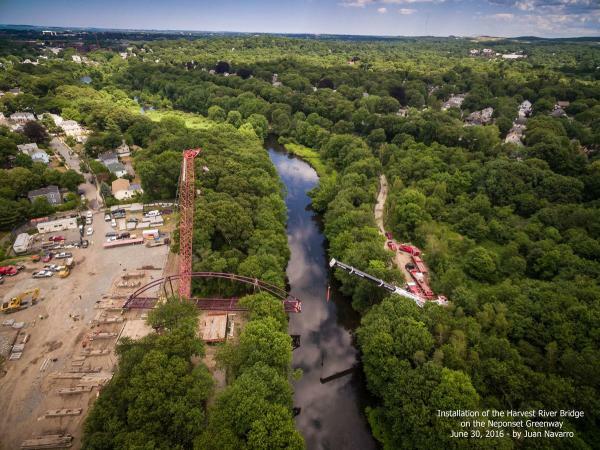 Last summer, construction crews used two large cranes to hoist a new bridge into place over the river connecting Milton and Mattapan near Ryan Playground. Along with a canopy walk that will carry trail-users over the trolley tracks near Mattapan Square, this new section of the Greenway is a fantastic addition— one that came at an expense of more than $12 million. It’s worth every dime. The parks and pathways that have bloomed along the Neponset over the last 30 years were a long time coming. But now that they’ve been created— and they are in heavy use— it’s up to us to help care for them. This weekend’s cleanup is a great way to pitch in. Go to Neponset.org to register and find where you can join the crews. It starts at 9 a.m.